Sweetie Belle had always been scared of thunderstorms. But not as this scared when she finds something under her bed. But she is shocked to find out it wasn't what she had expected it to be. Starlight tucks Twilight and Spike in for the night. Fluttershy goes to the doctor's office and has to get a shot. She is, of course, terrified. She can't stand it. It aggravates her so much, because it happens so often. Wanna know the other reason? When Flash is left alone once again, another student comforts him, like always. Starlight Glimmer has a very important question. Pinkie is sick and Fluttershy inherits her abilities for the day. How was I supposed to know she was blind? All I wanted to do was make her smile! R. Lee Ermey wakes in Ponyville. Hilarity ensues. A human has arrived with only one thing in his mind. And no one is going to stop him. When Twilight's clone escapes from Queen Chrysalis, she eventually discovers yet another clone in hiding. A young Sunset Shimmer is stuck foalsitting a pesky little unicorn. While babysitting Twilight's niece, Princess Flurry heart, Sunset Shimmer lets a colorful word slip by accident. Starlight Glimmer is thinking about dating Sunburst, Sunset Shimmer's little brother. This doesn't sit well with big sis. At all. Twilight and Sunburst have been growing awfully close, and it's starting to bug Starlight. The Dazzlings are forced to spend a whole night with Pinkie Pie. Rarity accidentally flushes Gummy down the toilet. Fluttershy never thought she would be called "Cute" before. Now that she has, she doesn't like it one bit. I'm sorry, Flutters, but there's no denying it. This is needed, but... Dammit Spike! "Hey so I just saved your life from a Hydra and I'm mad at you for calling me cute, so the least you can do is forgive me for forgetting your name." 7228506 Yes eLLen, you're cute too! I finally managed to find/ stumble into a Fluttershy (Explore Equestria series). Yay, finally got myself FS. And she's adorable. Don't worry too much. For a first-time attempt at writing about Fluttershy, this seems pretty decent. I'll give a more insightful comment later regarding the story and the technical details. Can we call you adorable Fluttershy-? Hmm. I wonder what that guy's name was though. As always, great story Summer! Doh! Blasted Spike sending letters at just the wrong time! “Can my daughter have a sample of one of your almond muffins?” the pony asked in a high nasally voice. Fluttershy stared up at her friend as if she just announced she was a changeling. Would it matter if she was? Plus, y'know...Spike can breathe fire at it. Yeah, it's not like Fluttershy ever vanquished a dragon and a cockatrice or anything. It's not like Pinkie Pie saved Ponyville from a swarm of Parasprites. Why do I get the feeling I know exactly where this is going? What did the Hydra say, Fluttershy?” Pinkie Pie asked. “The swamp water at Froggy Bottom Bog is thinning out,” Fluttershy explained. Oh. Guess I was wrong. Makes more sense, though. 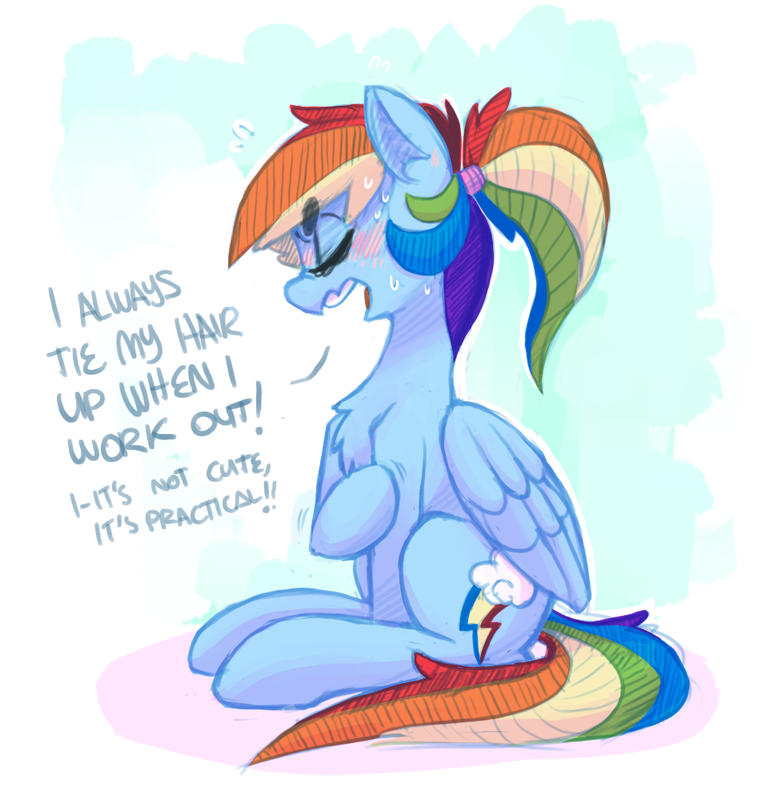 I thought it was mad because somepony called it cute. That was a fun little read. Love the running joke with Blue pony's name. Denying that you're cute just makes you seem cuter. Oh, Fluttershy! she mentally scolded herself, avoiding eye contact. How could you have forgotten something important as his NAME? She opened her mouth again before closing it shut, thinking against it. I’d ask what is, but...oh, that would be rude of me. He’ll think that I think his name wasn't important enough to remember! Ha! Yeeeeeep! I know all about that! I'm terrible with names and of course being too embarrassed to admit it and not wanting to come off as rude I regularly end up having full conversations with acquaintances while having absolutely no clue what their name is! 7229365 Plot : Button Mash actually knew and yelled his name when he was snatched by the Hydra. Yes, that means his name is Random Pony. Problem? One too many When's here. I love the story by the way. The characterization was just top notch. I especially liked Spike and Pinkie in this, that first fee scene where Pinkie and Spike were just talking before Fluttershy arrived. I think it would be kinda awesome to see a story about Pinkie and Spike spending the day together and getting into trouble. But the true gold of this fic was the Shy one. Nice. I hate being called "cute". "Don't Call Me That Please..."
Why does it makes me want to call her cute even more? Am I an horrible person for going against the wishes of such a cu-er... nice pony? Anyway, that story was... cute! Poor Fluttershy doesn't realize that ponies are both cute and adorable. One thing though, it sounds odd that Fluttershy says "when I release you". It isn't an actual spell, that stare and it would work just as well without that sentence, if you just went with “You’re going to put my friend down, and you’re going to tell me what’s wrong. Understand?” and not sound so much like she was using a spell or a physical bond. The moral of the the story? Cutie calls instead of cat calls? Oh, that was clever. I find the phrasing of this incredibly disturbing. I know what is meant to be said here, but the way it's set up, it seems like Spike is doing something a tad bit more morbid. Good story I had a few good laughs. It should actually be "rapping" rather than "wrapping".